Now at KPK: A Digital Library! 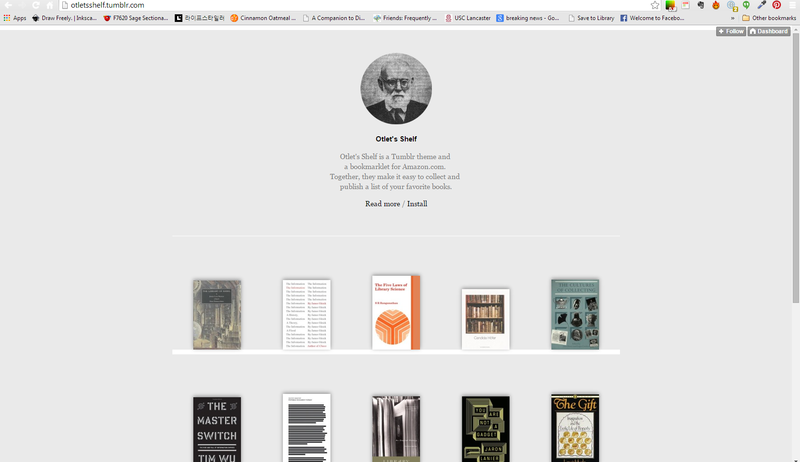 A Screen Capture of the Otlet’s Shelf Tumblr Theme. Over at my Academia.edu profile, my analytics place my Hallyu Bibliography posts in my top ten. Since the bibliography posts are helpful to KPK readers, I want to further assist Hallyu scholars and those working in the Digital Humanities (DH) field. To that end, I’ve been working on a project to make even more items (books, mainly) discoverable. As a result, I’m happy to present KPK’s Digital Library, housed in Tumblr using a cool theme called Otlet’s Shelf. Otlet’s Shelf is a theme that displays books in Tumblr, and it’s also a bookmarklet that allows me to mine Amazon.com for books and insert them into KPK’s Tumblr page. The application pulls book abstract information from Amazon and allows me to add keywords as needed. The keywords help users locate books that cover similar topics in the KPK Digital Library. The theme displays most recent entries first – when you click the “Next” button, you are accessing older entries. By the way, the first book that had the honor of inclusion is Hallyu: Influence of Korean Popular Culture in Asia and Beyond by Do Kyun Kim. The first KPK Digital Library Entry! In accordance with KPK’s mission, the KPK Digital Library includes monographs that discuss Hallyu from all of its interdisciplinary aspects – from music and media studies to politics, sociology, and of course fandom research. Because we are also interested in the development of the DH field, books covering DH are also included. At press time, there are 108 books in the KPK Digital Library, and more will be added as items are published. Keep in mind that the KPK Digital Library is a discovery resource, not an access portal. Your ability to access items will depend on several factors, including your proximity to and ability to use your local public, academic, or special libraries and their services (don’t forget the glory that is Interlibrary Loan). Additionally, some items may be available electronically via databases or downloadable for use in e-readers. If you want to find out if an item is available for checkout within a certain mile radius, try out WorldCat or WorldCat Mobile (for Android and iPhone)! To keep up with what’s being added to the KPK Digital Library, login to your Tumblr account and add us. When a new book is uploaded, you’ll see the book cover and its abstract appear in your dashboard. You can also stop by the KPK website anytime and click on the “Resources” link at the top of the page to see the latest activity. And of course, you can always just go directly to our Tumblr page and click on any book to get information. Consider using the KPK Digital Library as a complement to the Hallyu Bibliography posts. Together, the bibliography and the library are robust tools designed to help scholars develop and expand the Korean Studies, Hallyu Studies, and DH fields. Please send your feedback to me – I hope you find the KPK Digital Library “pop”-sitively useful.